As the results of Brexit continue to surface, a recent report has suggested that the vote could cause the economy to slow down, impacting the financial stability of businesses within the UK. Leading printing solutions provider, PrintDesigns has a wide range of bundle deals and discounts available on a selection of printed marketing solutions, giving economic confidence back to businesses that are concerned at the recent consumer attitudes while enabling them to promote their businesses successfully. The report on household reactions to the Brexit vote, conducted by market researchers GFK, found that consumer confidence was so low that it was experiencing the biggest downhill slide in 26 years. People were shown as having a negative outlook on their own finances, causing those surveyed to feel unsure about making big investment purchases such as household appliances and furniture. With less consumers willing to spend, many industries will be experiencing uncertain times ahead. Businesses looking to succeed throughout this troublesome financial landscape need to retain customers by keeping up momentum in their marketing activities, while keeping costs to a minimum. 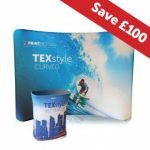 Starting at just £75, companies can purchase two classic roller banner stands, perfect for refreshing a branding or marketing message for upcoming trade show attendances or corporate meetings. The impressive range of TEXStyle fabric display stands, a premium product from Printdesigns, can also be bought in bundle deals, allowing businesses to utilise the visibility that these unique banner stands can bring them at a much lower cost.